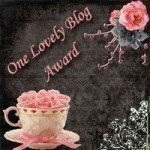 I’m honored to receive this One Lovely Blog Award from Jenna of A Mom’s Balancing Act and Mrs. Graig of Mom and Her Diary. Thanks so much, ladies! this is my first Blog Award…my pleasure to accept this one. Thanks for the award, Tetcha. It's up on my blog. I have posted the award already…thanks again! Hi Tetcha, Thanks for this award.